Puri – the city of temples resides in the state of Odisha. It is considered as a major fulcrum of pilgrimage in India, and is home to the famous Jagannath temple. The city is connected to the neighbouring city of Bhubaneswar and Calcutta via rail, road, and air. The tree major tourist spots – Puri, Bhubaneswar, and Konark, form the ‘Golden triangle of Odisha’ attracting visitors from all over the world. The land has been the harbinger of a number of temples, following the establishment of the ancient Jagannath shrine. It is one of the main attractions on which tourism thrives in the state. This temple is one of India’s largest sanctums. Did you know that it holds the largest kitchen in the world? Yes, the area covers almost an entire city block! It houses the famous wooden statues of Lord Krishna, his brother Balaram and sister Subhadra who are ritualistically worshipped within the temple. On the great chariot festival (Rath Yatra), the idols are let out in the city with great pomp and show. 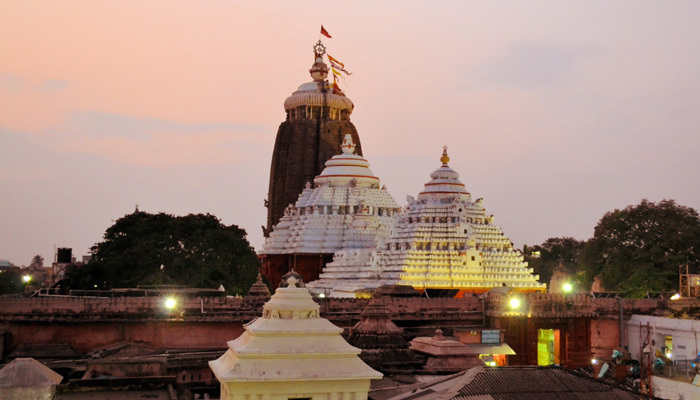 Jagannath temple has been built on a raised platform right in the core of the city. The area is enclosed by high walls on all sides and has four gates placed in the four directions – north, east, west, and south. Each gate bears a stone carving of an animal; on the east, you will find the Lion’s Gate; the north has the Elephant Gate, the south has the Horse Gate, and the west has the Tiger Gate. It is believed that the Elephant Gate belongs to the God himself. Pilgrims enter the temple through the Lion’s Gate. And that’s not all about Puri. The city also witnesses a lot of vibrant festivals and fairs. Have you ever heard of the ‘Pancha Tirtha’ bathing spots of the city? These include the Mahodadhi of the Puri Sea near Swargadwar, the Rohini Kunda, the Indradyumana Tank, the Swetaganga Tank, and the Markandeya Tank. The sea, the beach, and the aura make the land all the more welcoming. If you are planning to visit Puri and looking for a comfortable stay, don’t forget to book your accommodation at Hotel Balaji International. 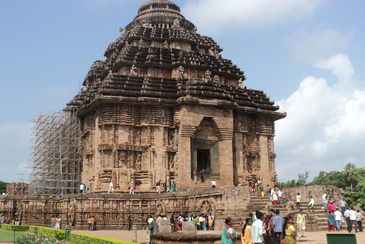 Konark is one of those tourist locations in the district of Puri which should not be given a miss. The most mesmeric attraction here is the Sun Temple, which is an ancient architecture built during the reign of King Narasimha. Although no worshipping of deities is witnessed here, the temple is known for its extraordinary architecture and stone sculptures. It is more like a celebration and an honour to the Sun God. The architecture is such that it looks like the Chariot of the Sun God. Twelve wheels have been carved out of stone with intricate details, and the chariot has been depicted as being pulled by seven horses. Other than that, a Natya Mandir lies near the temple where Devadasis are said to perform during ancient times. Another part of the temple is the Jagamohana – the audience hall. 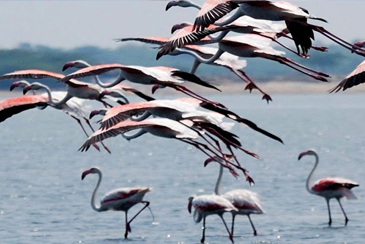 Did you know that this is India’s largest brackish water lagoon in India? And it’s also the second largest in the world! Chilika Lake is surrounded by the Nalaban Forests and homes the Kalijai Island, where an old temple of Goddess Kalijai resides. People go for a boat ride in the lake looking for Irrawaddy river dolphins. If you are lucky enough, you will surely be able to view some, playing in the waves of the water and surfacing every now and then. You can make a visit to the Mohana and enjoy seafood like fishes, crabs, and prawns. Nearby attractions include the Satapada town and the Parikud and Malud islands. 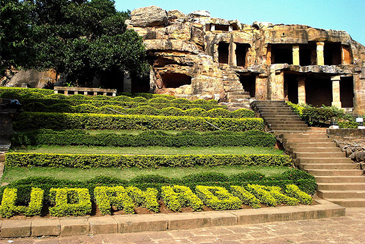 If you want to experience architectural excellence, do visit the Udayagiri and Khandagiri rock caves. The most incredible constructions here are the Rani Gumpha and the Hathi Gumpha. There are over 33 caves in the area built during the reign of Kharavela. It’s hard to get over the magic of such magnificent architecture. 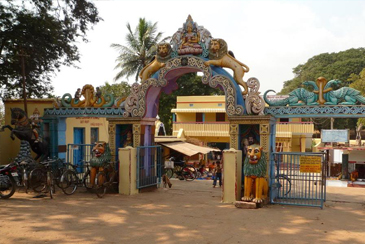 The Lokanath Temple of Puri is located very close to the Jagannath Temple. This shrine is dedicated to Lord Shiva and is believed to be established by Lord Rama himself. The architecture dates back to somewhere between the 10th to 11th century A.D. Devotees believe that the holy grounds have the power to heal illness and diseases. 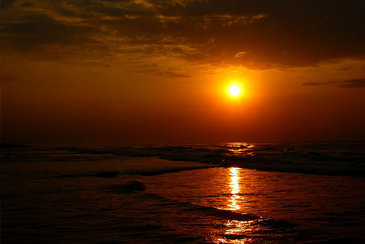 Also known as the Golden Beach, the Puri Beach is one of the prime attractions of the city. It is located very near to the railway station and bus bay. You can take a walk on the soft sand, enjoy coconut water, relish seafood, buy bric-a-bracs, and what not! Did you know that the beach witnessed the great Rath Yatra every year? And that it has also become the newest hub of a surfing festival? There’s so much that the sand and salt waters have to offer. If you are in Puri, you cannot simply miss a visit to the Golden Beach. Hotel Balaji International is located by the side of the beach itself. Do check into our hotel and make your stay a memorable one. A lesser known tourist spot near Puri is the heritage crafts village of Raghurajpur, which is a home to over a hundred families of craftsmen. 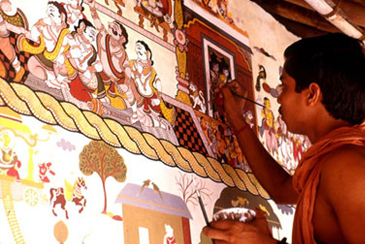 The village is famous for its Pattachitra paintings, which are exclusively handmade and exquisite. The paintings are created following a long and intricate process of manufacturing the canvas and the paint. Earth colours are used, which are manufactured from natural sources. Another craft popular here is the Ganjappa or the playing cards. Raghurajpur is also famous for the traditional Gotipua dance and is the birthplace of Guru Kelucharan Mohapatra – the legendary proponent of Odissi dance. The Nandankanan Zoological Park is located in the city of Bhubaneswar near Puri. It’s the first Indian zoo to be associated with the World Association of Zoos and Aquarium (WAZA). Nandankanan has been declared as a sanctuary and homes over a thousand species of animals, birds, and reptiles. The zoo also has 34 aquaria that contain freshwater fish in a large variety. It also has an Orchid House, which is the largest in the state of Odisha. 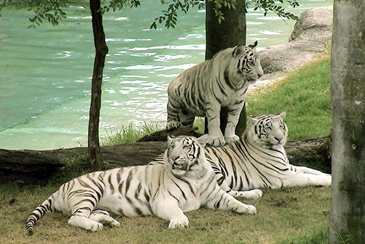 The zoo is also famous for the White Tigers which belong to a special Odisha strain instead of the usual Rewa strain. Apart from this, Nandankanan is a home to a variety of deer, antelopes, wild cats, parrots, peacocks, snakes, lizards, turtles, crocodiles, lions, tigers, leopards, and more.